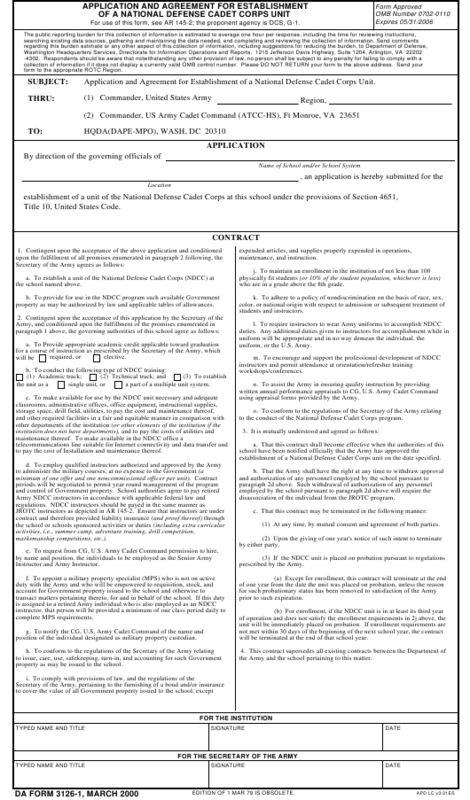 DA Form 3126-1 - also known as the "Application And Agreement For Establishment Of A National Defense Cadet Corps Unit (s&i Milpercen)" - is a Military form issued and used by the United States Department of the Army. The form - often mistakenly referred to as the DD form 3126-1 - was last revised on March 1, 2000. Download an up-to-date fillable PDF version of the DA 3126-1 below or request a copy through the chain of command. For use of this form, see AR 145-2; the proponent agency is DCS, G-1. form to the appropriate ROTC Region. Application and Agreement for Establishment of a National Defense Cadet Corps Unit. Title 10, United States Code. who are in a grade above the 8th grade. property as may be authorized by law and applicable tables of allowances. uniform, or the U.S. Army. a part of a multiple unit system. using appraisal forms provided by the Army. to the conduct of the National Defense Cadet Corps program. to pay the cost of Installation and maintenance thereof. establishment of a National Defense Cadet Corps unit on the date specified. disassociation of the individual from the JROTC program. (1) At any time, by mutual consent and agreement of both parties. will be terminated at the end of that school year. position of the individual designated as military property custodian. the Army and the school pertaining to this matter. property as may be issued to the school. EDITION OF 1 MAR 79 IS OBSOLETE. cabinets, and locked arms racks. Windows must be securely barred and doors reinforced and fitted with cylinder locks. for Army ROTC classes when scheduled. 6. WILL STUDENTS BE GIVEN A MEDICAL EXAMINATION? WILL NOT BE AVAILABLE FOR NDCC CEREMONIES.